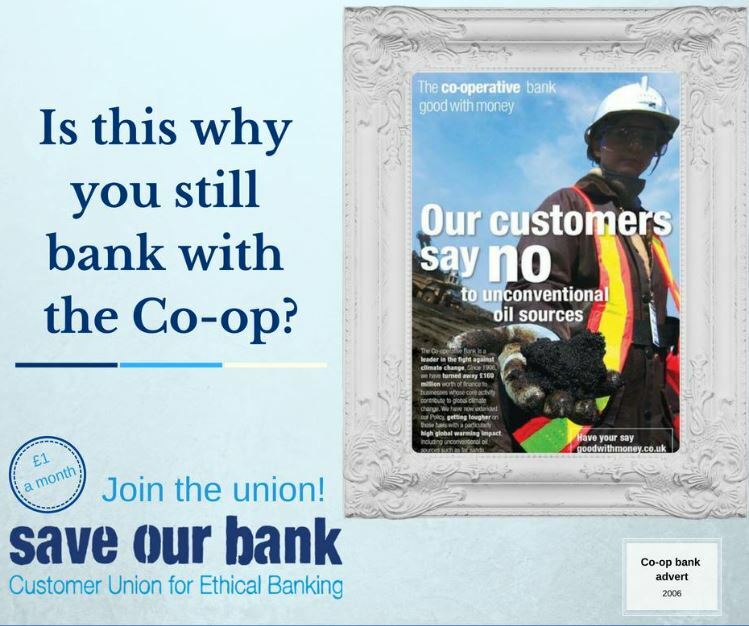 The Customer Union for Ethical Banking is an independent body representing customers of the Co-operative Bank. The Customer Union aims to ensure that the bank sticks to its word on being a an ethical bank with customer-led values. We aim to see an eventual return of the bank to majority cooperative ownership. The union is a co-operative itself, democratically controlled by its 1,500 members and regulated by the FCA. 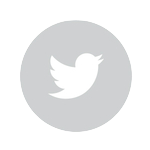 You can read about our governance here. Late in 2013 a deal was done to plug a huge gap in the Co-operative Bank’s balance sheet. The deal saved the bank, but it left its previous owner, the Co-operative Group, with a shareholding of only 30%, while private investors - including hedge funds - owned the rest. 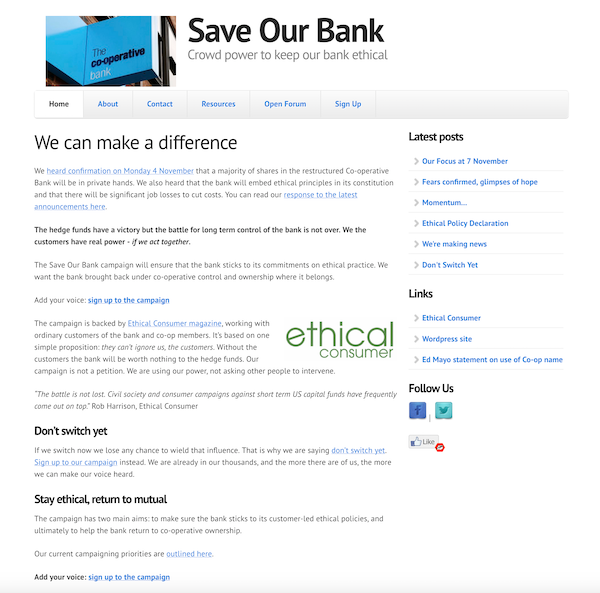 A group of Co-op Bank customers set up the Save Our Bank campaign with support from Ethical Consumer magazine with two aims: to ensure that the bank sticks to its principles and, with time, to help the bank return to some form of co-operative control. The Save Our Bank campaign launched in October 2013 with a press release “DON'T PANIC AND STICK WITH THE CO-OP SAYS SAVE OUR BANK”, as the Co-op Bank entered a period of crisis that left the Co-op Group with only a 30% shareholding (later reduced to zero).We called on customers not to switch, but to stick together. In a few months, 10,000 had signed up to the campaign, including major charities and campaigning organisations. In 2014 we campaigned for the bank to stick with its ethical policy and teamed up with Unite the Union to demand an ethical approach to executive pay. The bank launched an ethical survey and we scrutinized the process closely, warning the bank that slippage could result in a mass walk-out. We succeeded in getting the chief executive to promise in public that this would not be used as an excuse to water down the policy and that all existing commitments would be retained. In 2015 the bank launched its new ethical policy, with “nowt taken out” and expanded to cover five pillars: ethical banking, workplace and culture, products and services, campaigning and ethical business. We welcomed the new policy that came as a result. Next, we needed to move from a campaign led by Ethical Consumer magazine to an organization in our own right, with a budget to hold the bank to account. We crowd-funded to establish a Customer Union, smashing our £15,000 target and raising over £30,000 from over 1,500 supporters. And in December 2015 we launched a campaign including a petition on 38 degrees after the bank’s “de-risking” approach sees it close a swathe of accounts for groups like the Palestine Solidarity Campaign. At the start of 2016, the Customer Union was formally established as a co-operative. Then in July we held a round table with Amnesty UK on the impact of bank account closures on charities and campaign groups. Our work on this together with Amnesty leads to the bank putting in place a reinforced approach to de-risking, with the Values and Ethics team reviewing the impact of account closures. Amnesty’s UK director Kate Allen welcomed the change in practice. We also held our first Gathering in November 2016. The start of 2017 saw the Co-op Bank put “up for sale” in a bid to further strengthen its capital position. Save Our Bank commissioned a briefing paper, “Capital raising at cooperative banks”, to inform the discussion on how the bank could raise capital in a way that enhanced rather than reduced co-operative ownership or customer control. After a lengthy search for a buyer, the bank’s existing owners stump up more capital, and in September 2017 the process is completed. The Co-op Group’s stake in the bank falls to zero but the bank remains independent. In December 2017 we held our second Gathering at which we elected an expanded six-person board of directors. We also held a vote of all Customer Union members on whether to stay with the bank under the new ownership, in which 96% voted to stay, on a 43% turnout. In 2018 we published an analysis of the Co-op Bank’s gender pay gap figures compared to the rest of the sector. We also published an analysis of the bank’s Values and Ethics report, as well as the bank’s response to our questions. We developed some shareable images for Facebook to spread the word about the Union (see here and here), and finally held our third Gathering, with a speaker from Unite the Union as well as the bank’s new Communications Director Lesley McPherson.